View More In Rain Covers. 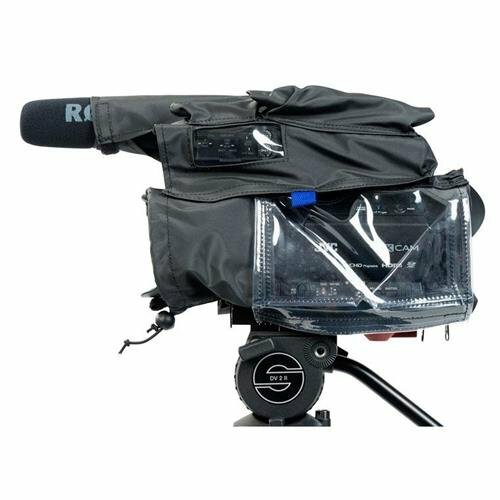 The camRade wetSuit GY-HM170/200 is a tailor-made rain cover that protects your camera against the elements. Made of a special fabric with a soft lining this flexible cover can be used for both the GY-HM170 and the GY-HM200 because of the detachable top cover. The soft fabric lining minimalizes unwanted sound effects caused by wind and rain during operation. The cover also reduces the chance of the camera overheating by allowing hot air to escape via openings. The monitor is protected by a vinyl window that can be opened for easy view and access. The top handle cover for the GY-HM200 also covers the microphone and has a window to view the audio controls. The bottom of the cover can be opened and closed with a double zipper. This item is supplied in a waterproof pouch with zipper, which you can use for storage and transportation of the cover when not in active use.